Motta and her team used radio telescopes at the Atacama Large Millimeter/submillimeter Array (ALMA) to measure the acceleration of the speed of gas across the Cosmic Seagull’s disk, from the center out to about 9,800 light-years, revealing that the galaxy’s far reaches are dominated by the invisible force we call dark matter. Her team’s finding contrasts with a recent claim that such distant galaxies are oddly lacking in dark matter according to a 2017 study by astronomer Reinhard Genzel of the Max Planck Institute for Extraterrestrial Physics in Garching, Germany, who found that due to the scarcity of dark matter in 100 distant galaxies the slower stars are found at the edges and faster stars in the central regions. The Cosmic Seagull galaxy lies behind the Bullet Cluster of galaxies , whose regular matter (red, depicting X-rays emitted by hot gas) seems separate from its dark matter (blue, inferred by distortion of galaxies in the background). The Bullet Cluster’s mass magnified the Seagull’s image and let astronomers observe the smaller galaxy in detail. 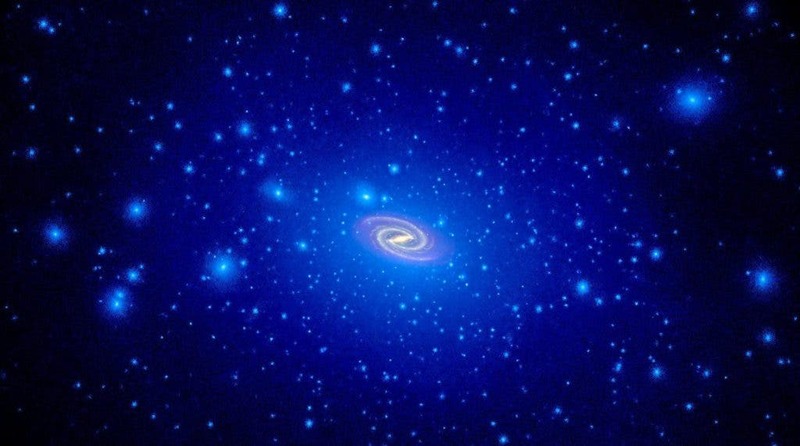 Motta and her colleagues were able to probe dark matter in the most distant galaxy yet, thanks to gravitational lensing and the massive cosmic train wreck called the Bullet Cluster. The distortion from gravitational lensing reminded Motta’s team of the seagull logo of a popular music festival in Viña del Mar, Chile. But it also made the galaxy appear magnified by a factor of 50 — setting a new record. “Motta et al have exquisite data,” but their observations are limited, Ellis wrote in an e-mail to Science News. The team looked at only one galaxy, and that galaxy is much smaller and less massive than those that seem short on dark matter. Furthermore, the observations don’t cover the entire galactic disk, so the stars may be slower farther out than the team can see.